Malaysian Hall Canteen - the best place for Malay chap fan! Malay rice, Nasi Kandar, whatever you feel like calling it. I mean the best in London (at least I have not found another Malaysian place which serves something similar and the food quality is equally or even better). The portion is not generous at all. 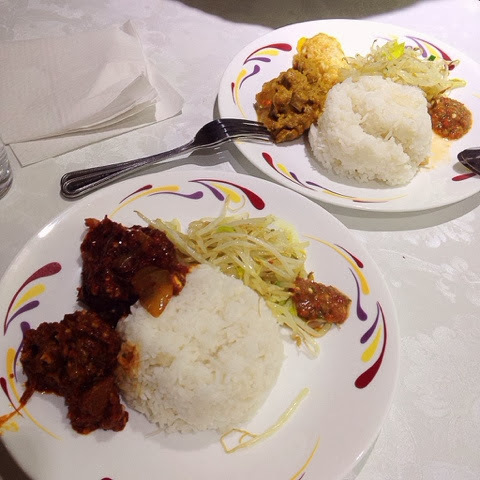 At least the price was only £5 for a plate with three dishes. It pretty much would help if you're missing home plus the belacan is really spicy! I'm not going through the details (it's mostly curry and vegetables) of what I've picked for that night, but it's definitely up to par. Malaysian Hall Canteen is now a newly renovated canteen - to a prettier and nicer one. Previously I've read reviews of people condemning how awful it looks - rest assured it's actually much prettier now; most importantly it's clean! The toilets are unfortunately, filthy and wet just like the ones you see in Malaysia.